Thus, charged particles can drift in either direction along magnetic field-lines in regions where . However, particles are excluded from regions where (because they cannot have imaginary parallel velocities). Evidently, charged particles must reverse direction at those points on magnetic field-lines where . Such points are termed bounce points or mirror points. Consider the magnetic field configuration illustrated in Figure 2.1. As indicated, this configuration is most easily produced by two Helmholtz coils. Incidentally, this type of magnetic confinement device is called a magnetic mirror machine. 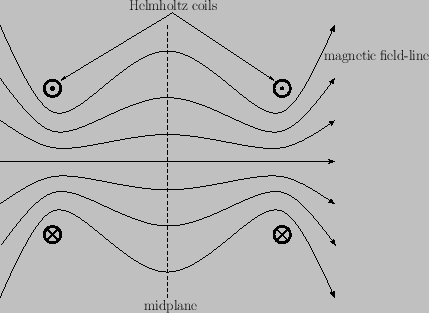 The magnetic field configuration obviously possesses axial symmetry. Let be a coordinate that measures distance along the axis of symmetry. Suppose that corresponds to the midplane of the device (that is, halfway between the two field-coils). Figure 2.1: Schematic cross-section of a magnetic mirror machine employing two Helmholtz coils. 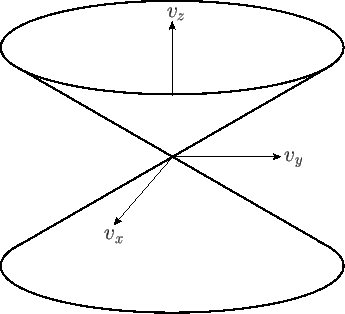 Figure 2.2: A loss cone in velocity space. Particles whose velocity vectors lie inside the cone are not reflected by the magnetic field. If plasma is placed inside a magnetic mirror machine then all of the particles whose velocities lie in the loss cone promptly escape, but the remaining particles are confined. Unfortunately, that is not the end of the story. There is no such thing as an absolutely collisionless plasma. Collisions take place at a low rate, even in very hot plasmas. One important effect of collisions is to cause diffusion of particles in velocity space (Hazeltine and Waelbroeck 2004). Thus, collisions in a mirror machine continuously scatter trapped particles into the loss cone, giving rise to a slow leakage of plasma out of the device. Even worse, plasmas whose distribution functions deviate strongly from an isotropic Maxwellian (for instance, a plasma confined in a mirror machine) are prone to velocity-space instabilities (see Chapter 8) that tend to relax the distribution function back to a Maxwellian. Such instabilities can have a disastrous effect on plasma confinement in a mirror machine.